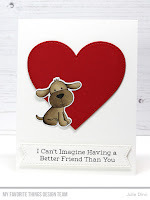 The new Furever Friends card kit is now available! Be sure to grab yours before they sell out! I have a couple of sweet and simple cards to share with you today. I paired a few of the adorable dogs in the Furever Friends stamp set with the large Red Hot heart from the Stitched Heart Die-namics. The dogs were both stamped on X-press It Card Stock and coloured with Copics. I assume you paper pieced the dog bed. I wasn't sure until I looked at your supply list. The hearts on the dog bed just look so cute and add so much to the card. Thanks for the idea! How adorable. I hadn’t thought about how cute it would be for Valentine’s Day. These cards are so adorable and so CAS. Love them. 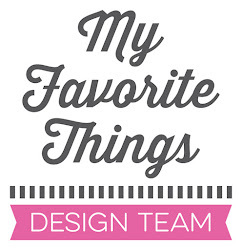 You've convinced me--must get this kit! Your cards are so sweet! super cute cards, fairly simple and effective. Love the idea of using this Kit for Valentine's cards - thanks for the inspiration! This is so cute and makes a nice Valentine. Very sweet cards. Love the puppy faces. Love your sweet CAS style cards. Simple elegant cards. The puppies are so cute. Valentines Day here we come! Love! 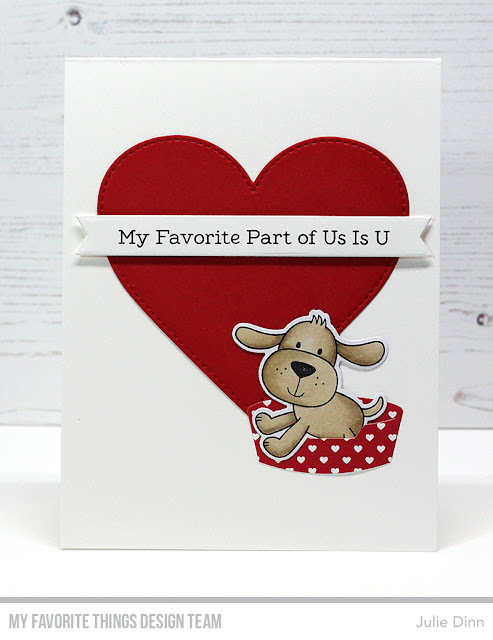 OK, yup...a puppy with a red heart BG is a perfect Valentine's Day card (so sweet)! Love this kit and the cards you made are so sweet! cute dogs and I like all of the hearts. Love your cards! The heart print dog bed is adorable! Adorable! Cute card for Valentine's Day - thanks for the inspiration! That 'favorite part of Us' sentiment is my fav in the set!! Love how you colored the sweet pups! Adorable puppy love! Cute images!